The Bill was read a first time on 11th May, 2006. Hon. G. A. Clarke: To move the Resumption of debate on the Second Reading of the Road Traffic (Amendment) Bill, 2006. Notice of this Bill was given on 25th July, 2006. The Bill was read a first time on 25th July, 2006. The Bill first appeared in the Official Gazette on 31st July, 2006. On 2nd August, 2006, Hon. G. A. Clarke spoke and moved, seconded by Hon. R. C. Eastmond that the Bill be read a second time. Hon. D. D. Marshall spoke. Mr. C. A. Mascoll spoke. Dr D. C. Estwick spoke. Mr. R. St. C. Toppin spoke. Mr. R. St. C. Toppin. Rt. Hon. O. S. Arthur: To move the Second Reading of the Defence (Amendment) Bill, 2006. Notice of this Bill was given on 4th August, 2006. The Bill was read a first time on 8th August, 2006. The Bill first appeared in the Official Gazette on 14th August, 2006. Hon. R. C. Eastmond: To move the Second Reading of the Technical and Vocational Education and Training Council (Amendment) Bill, 2006. Hon. D. D. Marshall: To move the Second Reading of the Police Complaints Authority (Amendment) Bill, 2006. Notice of this Resolution was given on 10th October, 2006. The Bill was read a first time on 10th October, 2006. (a) Hon. Miss M. A. Mottley: To move the passing of a Resolution to grant the sum of $ 90 087 from the Consolidated Fund and to place it at the disposal of the Government to supplement the Estimates 2006-2007 as shown in the Supplementary Estimates No.3 2006-2007 which form the Schedule to the Resolution. Notice of this Resolution was given on 3rd November, 2006. Hon. R. R. Farley: To move the passing of a Resolution to approve the lease in accordance with section 5 of the Crown Lands (Vesting and Disposal) Act, Cap. 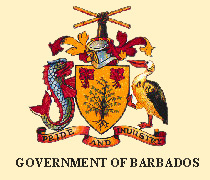 225 to the Trustees of the Barbados Football Association of a parcel of land, the property of the Crown, situate at Wildey in the parish of Christ Church, in this Island for the construction of an international football field and associated facilities. Notice of this Resolution was given on 9th November, 2006. Hon. R. R. Farley: To move the passing of a Resolution to approve the vesting in the National Housing Corporation of parcels of land the property of the Crown at Cave Hill, St. Michael for residential purposes. Notice of this Resolution was given on 14th November, 2006. (a) Hon. Miss M. A. Mottley: To move the passing of a Resolution to grant the sum of $ 4 510 469 from the Consolidated Fund and to place it at the disposal of the Government to supplement the Estimates 2006-2007 as shown in the Supplementary Estimates No.4 2006-2007 which form the Schedule to the Resolution.